I made this for my sister's birthday. The base is a fluffy, tender and airy coconut sponge cake. Make sure your oven is preheated to 350 F and position the rack in the middle of the oven. Toast 1/2 cup of the shredded coconut in a skillet on the stove until lightly golden. Allow it to cool in a bowl. Sift Flour. Add 3/4 cup of sugar to the flour. In a mixer with a whisk attachment beat together the salt, fresh egg whites, cream of tartar, water, coconut extract and vanilla extract. Beat together on medium speed until soft peaks form. Start to add 3/4 sugar into the eggs gradually about a couple tbs at a time waiting for 20 seconds after each tbs. Once all of the sugar is in (about 1 minute) mix the eggs on medium high for about 2 minutes. 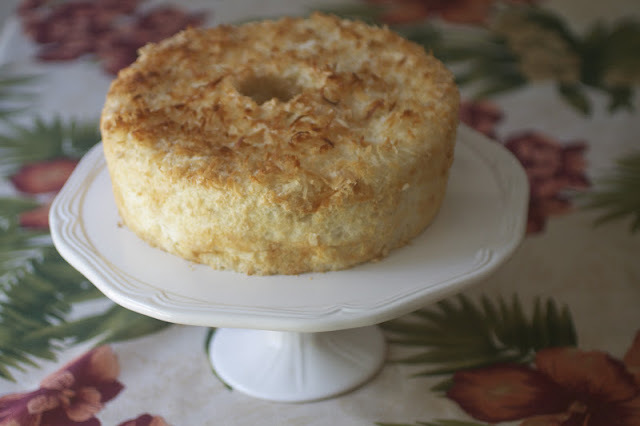 In batches fold the flour and toasted coconut into the egg whites until all is incorporated. Poor the batter into the ungreased bunt pan. 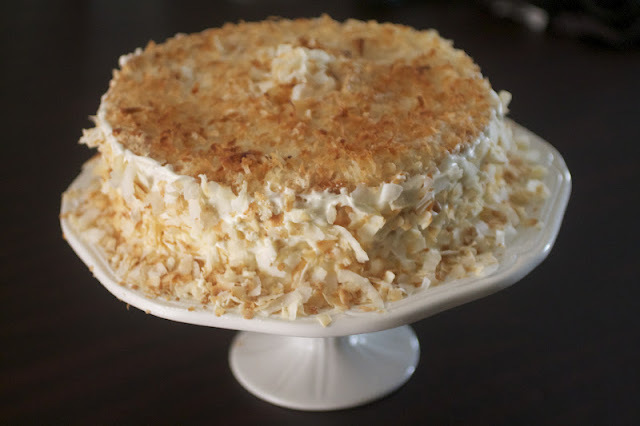 Sprinkle the 1/2 cup of the untoasted shredded coconut that is left on to the cake batter. Bake for 30-35 mins or until light golden brown. 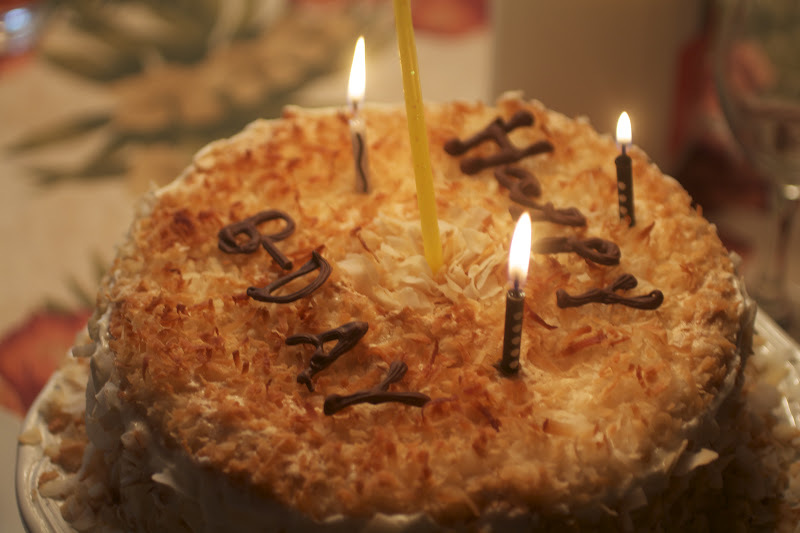 Remove the cake and turn it upside down for 2 hours so that the egg whites do not deflate. This is why the pan is ungreased because if it was greased than the cake would have slid out. 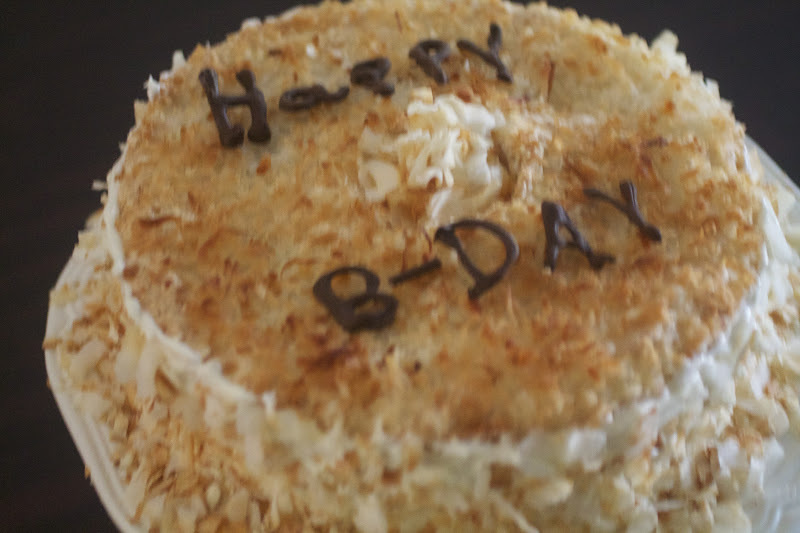 Run a knife around the edges, flip it out of the pan and coconut side up onto a cake platter. In a electric mixing bowl beat the cream cheese and butter on medium high speed for 2 minutes. Add salt and bourbon and beat for another minute. In batches add in the sugar. Once all of the sugar is in, beat the mixture for 5 minutes. To make the chocolate letters. Melt the semi sweet chocolate and place it into a pastry bag with a tip of your choice. Write out your letters onto a parchment paper lined cookie sheet. Let them set. Melt the white chocolate and spread it thickly onto a plate. Let it cool and crumble it into sand-like pieces. Frost the sides of the cake just so that there is enough frosting to cover the cake.Fill the middle hole with frosting. Top the frosting in the middle and the sides with some of the toasted flaked coconut and finely crumbled white chocolate. Leave the top unfrosted and top with your chocolate letters.